Ratio and Proportion are linked closely with multiplication, division and fractions. Scaling problems, such as making a number ten times larger, or finding half the size of an amount, are the solid foundation on which ratio and proportion are built. This simple activity can be used across Key Stage One and Key Stage Two, sparking discussions and developing children’s reasoning around these ideas. 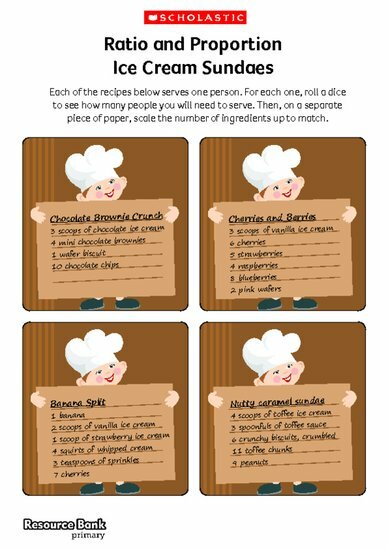 For each recipe, children must roll a dice to find out how many people they need to serve. Then they scale up the sundae recipes as required.